We love Lent and the traditions we’ve built around it. I love this time to focus on Jesus. We keep Lent simple. The focus is on prayer, fasting, and giving. 1. 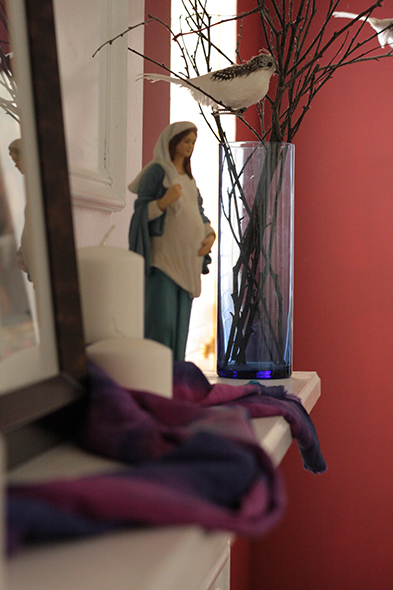 We drape a purple silk on the mantle to remind us of the liturgical season. We also light a purple candle every night at supper. 2. We have a “crown of thorns” and every time someone does a good deed, we remove one thorn. We used a salt dough wreath in the past, but this year, I wanted to use a grapevine wreath from the store. However, I never made it there, so now we are just removing toothpick thorns from a jar and hoping our jar will be empty of thorns by Easter. 3. We hide the Alleluia. This year we painted the word on a scrap of wood and hid it in a little box that we will open on Easter Sunday at breakfast. 4. We give things up and try to do extra prayers – the Stations of the Cross on Fridays, for example – and go to daily Mass more often. The children give up extra chore money to their Rice Bowl. 5. We color in this Lenten calendar. And do these meditations as part of our Morning Time readings. 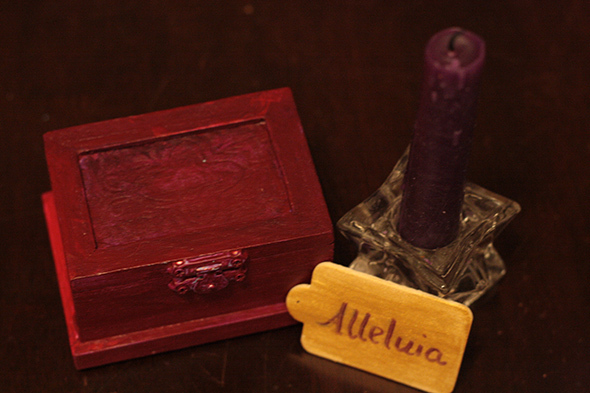 How do you observe Lent in your home?